The Type Approval proposals, currently working their way through the IMCO Committee, have already gone some way down this road with ABS set to become mandatory on all bikes over 125cc while arguments continue as to its cost and benefit on smaller bikes. Equally, we’re all aware that the current Type Approval text allows for anti-tampering measures in the as yet unwritten delegated acts (despite there being no proof that tampering is in any way a quantifiable problem). At EU level, I intend also to target specifically fatalities on motorcycles in 2012, we need to see the current trend reversed and these deaths start to fall. That’s still our view today, almost two full years later, and despite the ongoing situation around the proposed Type Approval regulations which if passed as they stand will implement some of the technical “solutions” sought by Commissioner Kallas. Ultimately, the statement by the Commission which we quote below is simply a re-hash of what they said back in 2010. What makes this noteworthy is the timing. 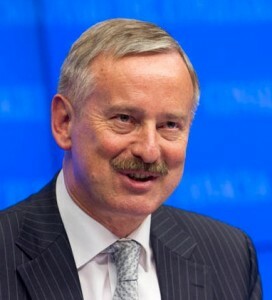 Why has Commissioner Kallas reminded everyone of the “New focus on Motorcyclists” just as the formal discussions around the Type Approval regulations are heating up? Motorcyclists are already lowering their casualty figures by boosting their skill levels with training. To reduce them further requires other road users to become better trained. MAG Ireland has consistently promoted training and awareness measures as the only proven way to reduce casualties amongst motorcyclists. The continued bias towards technical measures (ABS, PTI, anti-tamper, etc.) at the expense of training and awareness amongst all road users is a classic case of Brussels having mis-diagnosed the problem. For example, we already know that few motorcycles fail PTI tests and the MAIDS study tells us that it’s a factor in less than 1% of cases, yet the EU continues to focus on technical measures like PTI which will have little or no impact on rider safety. In trying to solve the ‘problem’ and make us ‘safer’, the EU has “looked but failed to see” the root cause – faults in other road users behaviour. Text of the EU Statement. Brussels, 29 March 2012 – Progress in cutting road fatalities significantly slowed last year (to -2%) compared with a very promising EU-wide reduction throughout the last decade (on average -6%), according to new figures published today by the European Commission. Worse still, some EU Member States, like Germany and Sweden, who have very strong safety records, now show a significant increase in deaths. In other Member States, like Poland and Belgium – already lagging behind in road safety – the number of deaths went up. 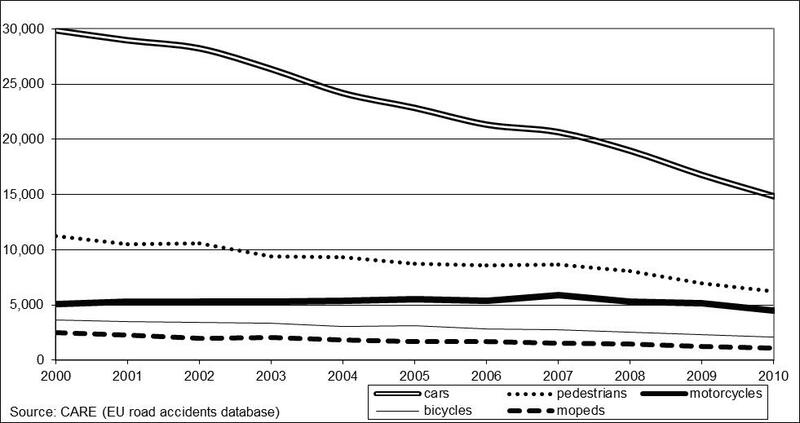 The problem of motorcycles – where fatalities have still not fallen after more than a decade – still persists. The attached table – “road fatalities per country” – shows progress since 2001, with EU-wide figures and a breakdown per country. 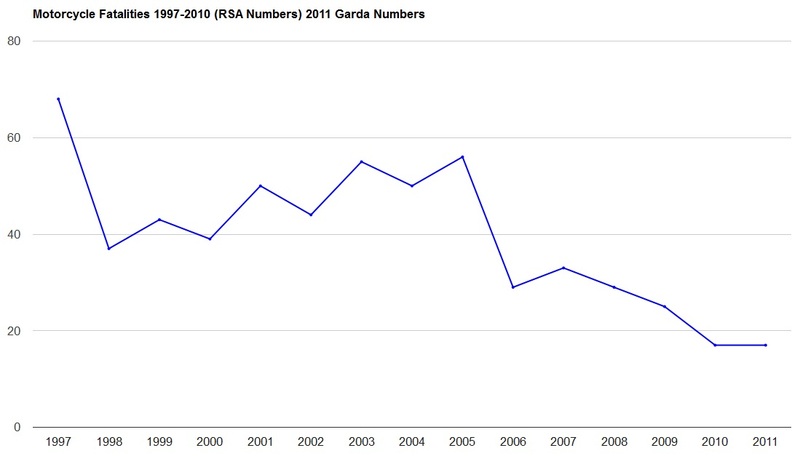 It includes the most recent figures for 2011. Over the last decade, under the Road Safety Action Plan 2001-2011, major progress has been achieved. Road fatalities were cut by almost 45% and more than 125,000 lives were saved. EU road deaths decreased by on average 6% each year. And in some years the decrease has been as much as 11% (2010). In July 2010 the Commission adopted challenging plans to reduce the number of deaths on Europe’s roads by half in the next 10 years. Initiatives proposed in the “European Road Safety Policy Orientations 2011-2020” range from setting higher standards for vehicle safety, to improving the training of road users, and increasing the enforcement of road rules. The Commission is working closely with Member States to implement this programme. The road safety action plan sets out a mix of initiatives focussing on making improvements to vehicles, infrastructure and road users’ behaviour. A new focus on motorcyclists. Detailed measures for each strategic objective are listed in MEMO/10/343. MAG Ireland note: The source contains further information including a table of fatalities broken down by country. The graph at the bottom of the EU Commission statement is the basis for the statement released on Friday, and we reproduce it here for your information. 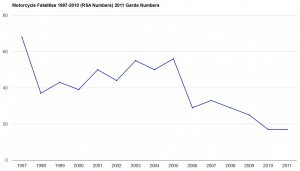 For Comparison, here are the Irish fatality rates for motorcycle riders and pillion passengers from 1997 to 2011. There have been big reductions since 2005 which correlates with the introduction of the Axa/Quinn assessments and a surge in the numbers taking pre and post test training since the middle of the last decade. The bottom line: MAG Ireland has consistently worked to improve safety for and amongst riders for well over a decade. MAG Ireland was instrumental in setting up the Irish Rider Training Association to provide affordable high quality training at a time when the Government completely ignored the deplorable lack of regulation in the driver training sector. MAG Ireland co-authored the RSA’s “This is your bike” booklet, and continues to campaign for better awareness of motorcyclists amongst other road users. We believe that prevention is better than cure. We know from direct experience that training, and particularly advanced training, is effective in reducing motorcycle casualties. We also know that many of the technical measures proposed such as Periodic Technical Inspection and Mandatory High Visibility Clothing are not.